3 dosage forms are manufactured: for dogs, dogs and cats and for cats. 180 ml and 270 ml polymeric bottles. Specifically developed for killing parasites. Washes hair well, saves and improves hair structure. Foams in water of any hardness and easily washes away. The shampoo contains 0.01% deltametrin, as well as excipients including glycerol, lanolin, herbal extracts (camomile, marigold, foalfoot). Meadow insecticidal shampoo is an insecticidal drug for external use. It has washing properties foaming in water of any hardness and easily washing away. Deltametrin (synthetic pyrethroid) provides frank contact insecticidal effect on imaginal and larval development phases of fleas, sucking lice and lice parasitizing dogs and cats. Excipients moisturize and soften skin, improve metabolic processes in hair roots, provide shiny hair and remove animal characteristic odor. 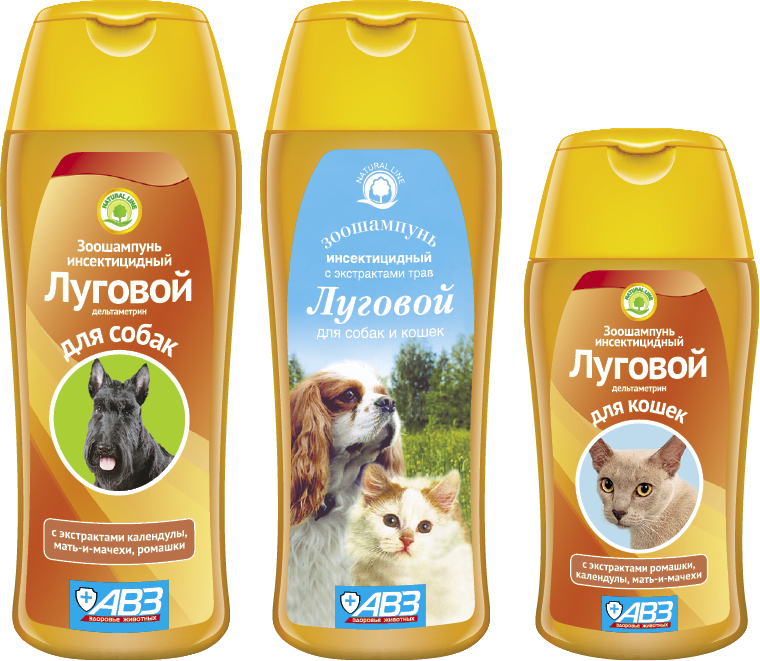 Use Meadow insecticidal shampoo for treatment of canine and feline entomosis caused by fleas, sucking lice and lice. Increased individual sensitivity to the drug components. Contraindicated for contagious and recovering animals, lactating females, as well as to kittens and puppies under 12 weeks old. Freely moisturize animal hair with warm water, then apply shampoo (0.5-1.0 ml per 1 kg of body weight) equally distributing it along the body surface and gently rub until foam appears. In 5-7 minutes accurately wash it away, comb and dry hair. Reprocessing: no more than once in 10 days. Process animal beddings with the shampoo dissolved in water (1:5) in amount of 10 ml per 1 sq. m of surface. Avoid shampoo contact with mucosae and licking by an animal. In case of increased individual sensitivity to the drug components, individual reactions may be observed (excess salivation, lacrimation, signs of skin inflammation). In this case wash the drug away with water and administer antihistaminic and symptomatic drugs. Keep out of the reach of children and animals. Store separately from food and animal feeding at 0-25°С.